Finlay, Christopher J. 2018. The Deadly Serious Causes of Legitimate Rebellion: Between the Wrongs of Terrorism and the Crimes of War. Criminal Law and Philosophy, Vol. 12, Issue. 2, p. 271. Demont-Biaggi, Florian 2017. The Nature of Peace and the Morality of Armed Conflict. p. 83. Lazar, Seth 2017. Just War Theory: Revisionists Versus Traditionalists. Annual Review of Political Science, Vol. 20, Issue. 1, p. 37. Lippert-Rasmussen, Kasper 2017. Pogge, poverty, and war. Politics, Philosophy & Economics, Vol. 16, Issue. 4, p. 446. Lazar, Seth 2015. Risky Killing and the Ethics of War. Ethics, Vol. 126, Issue. 1, p. 91. LAZAR, SETH 2014. Necessity and non-combatant immunity. Review of International Studies, Vol. 40, Issue. 01, p. 53. DILL, JANINA 2013. Should International Law Ensure the Moral Acceptability of War?. Leiden Journal of International Law, Vol. 26, Issue. 02, p. 253. SHUE, HENRY 2013. Laws of War, Morality, and International Politics: Compliance, Stringency, and Limits. Leiden Journal of International Law, Vol. 26, Issue. 02, p. 271. 1 The Political Writings of Jean Jacques Rousseau, vol. I, Vaughan, C. E., ed. (Oxford: Basil Blackwell, 1962), p. 303. (“Ah, barbarous philosopher! Come read us your book on a battlefield.”) Thanks to Cheyney Ryan for this quotation. 2 Walzer, Michael, Just and Unjust Wars, 4th ed. (New York: Basic Books, 2006 ), p. 34. “Here is the critical test, then, for anyone who argues that the rules of war are grounded in a theory of rights: to make the combatant/noncombatant distinction plausible in terms of the theory, that is, to provide a detailed account of the history of individual rights under the conditions of war and battle—how they are retained, lost, exchanged (for war rights) and recovered. That is my purpose in the chapters that follow.” Ibid., p. 137. 3 McMahan writes: “To say that a person is morally liable to be harmed in a certain way is to say that his own action has made it the case that to harm him in that way would not wrong him, or contravene his rights.” McMahan, Jeff, Killing in War (Oxford: Oxford University Press, 2009), p. 11. 4 Ibid., p. 156 and passim. 5 Walzer, Just and Unjust Wars, p. 43. 6 Rousseau, Jean-Jacques, The Social Contract, bk. 1, Cranston, Maurice, trans. (Harmondsworth, U.K.: Penguin, 1968), chap. 4, p. 56. 7 McMahan, Killing in War, pp. 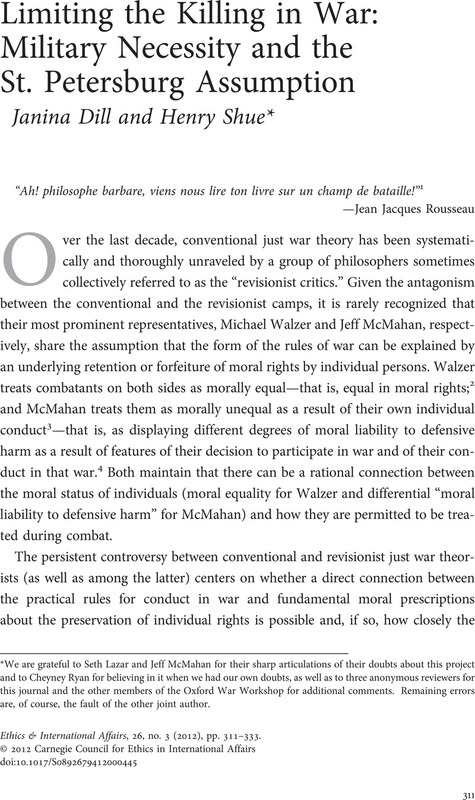 108 and 109; and McMahan, Jeff, “The Just Distribution of Harm Between Combatants and Noncombatants,” Philosophy & Public Policy 38, no. 4 (2010), p. 358. 8 For a fuller explanation of the practical impossibility of fair distribution of combat deaths and wounds, see Shue, Henry, “Do We Need a ‘Morality of War’?” in Rodin, David and Shue, Henry, eds., Just and Unjust Warriors: The Moral and Legal Status of Soldiers (Oxford: Oxford University Press, 2008), pp. 87–111; and Shue, Henry, “Laws of War,” in Besson, Samantha and Tasioulas, John, eds., The Philosophy of International Law (Oxford: Oxford University Press, 2010), pp. 519–22. For further difficulties for McMahan's current formulations, see Lazar, Seth, “The Responsibility Dilemma for Killing in War,” Philosophy & Public Affairs 38, no. 2 (2010), pp. 180–213; and Dill, Janina, “Should International Law Ensure the Moral Acceptability of War,” Leiden Journal of International Law (forthcoming). 9 We appreciate that McMahan distinguishes liability from desert, but harms to which one is justifiably liable must still be appropriate to one's degree of liability. 10 This is a summary conclusion based on more extensive arguments made elsewhere; for problems with McMahan's responses to this important judgment that war inflicts disproportionate suffering, see in particular Lazar, Seth, “Responsibility, Risk, and Killing in Self-Defense,” Ethics 119, no. 4 (July 2009), pp. 699–728. 11 Walzer actually has several explanations for the claim of moral equality, but our complaint is not with particular explanations. 12 Walzer, Just and Unjust Wars, p. 145. Walzer also writes: Combatants as “a class are set apart from the world of peaceful activity; they are trained to fight, provided with weapons, required to fight on command. No doubt, they do not always fight; nor is war their personal enterprise. But it is the enterprise of their class, and this fact radically distinguishes the individual soldier from the civilians he leaves behind.” Ibid., p. 144. 13 Walzer writes: “A legitimate act of war is one that does not violate the rights of the people against whom it is directed.” Walzer, Just and Unjust Wars, p. 135. In combination with the explicit permission of intentionally killing combatants, that statement implies that Walzer does not believe the rights of combatants who die or are wounded in war to be infringed. 14 Thinking otherwise would be like assuming a market can be counted on to generate a fair distribution. 15 We are not denying that a valid third-person moral judgment is possible. We note that no institution exists that will be authoritative for participants on both sides of a war over which third-person moral judgment is correct. 16 Declaration Renouncing the Use, in Time of War, of Explosive Projectiles Under 400 Grammes Weight. Saint Petersburg, 29 November/11 December 1868 [herein St. Petersburg Declaration]. 17 Sandoz, Yves, Swinarski, Christophe, and Zimmermann, Bruno, eds., Commentary on the Additional Protocols of 8 June 1977 to the Geneva Conventions (Geneva: Martinus Nijhoff for the ICRC, 1987), p. 396. 19 United Kingdom, Ministry of Defence, The Manual of the Law of Armed Conflict (Oxford: Oxford University Press, 2004), 2.2.1 (b). The British manual is of course quoting the Lieber Code, art. 14. 20 See, e.g., [Gen.] Hartmann, Julius von, “Militärische Nothwendigkeit und Humanität,” Deutsche Rundschau 13 (1877), pp. 111–28 and 450–71, quoted in Hull, Isabel V., Absolute Destruction: Military Culture and the Practices of War in Imperial Germany (Ithaca, N.Y.: Cornell University Press, 2005), pp. 123–24; see also Hull, pp. 122–26 generally. 21 Renault, Louis, “War and the Law of Nations in the Twentieth Century,” American Journal of International Law 9, no. 1 (1915), p. 3. 22 Sentences 2 and 3 of the Preamble to the St. Petersburg Declaration. The analysis of the centrality of this principle is more fully developed in Dill, Janina, The Definition of a Legitimate Target in U.S. Air Warfare: A Normative Enquiry into the Effectiveness of International Law in Regulating Combat Operations (D.Phil. Oxon., 2011), chap. 2. 23 Sassòli, Marco, “Targeting: The Scope and Utility of the Concept of ‘Military Objectives’ for the Protection of Civilians in Contemporary Armed Conflicts,” in Wippman, David and Evangelista, Matthew, eds., New Wars, New Laws? Applying the Laws of War in 21st Century Conflicts (Ardsley, N.Y.: Transnational Publishers, 2005), p. 191. It is of course not the case that any military force can “sufficiently weaken” any other military force. That could be true only if, per impossible, either side could win any war. Sassòli's proposition can plausibly mean only the following: if a military force can sufficiently weaken the military forces of an adversary, it can go on to achieve its political goal in fighting. 24 Terrorists will of course claim that attacking civilians can also be effective. The extent to which that is true is highly debatable, but its truth is made irrelevant. All that the principle of military necessity requires is one effective way. If there is more than one effective way, one is required to choose the effective way that most alleviates the calamities of war, which are normally understood to be calamities for civilians. 25 A war in which it could in fact not be done directly—for example, a war that could be won only by terror tactics like carpet bombing of cities and suicide bombings—is therefore an impermissible war to fight. The St. Petersburg assumption thus also has implications for the resort to war and other violence. This makes justifiable resort contingent on justifiable conduct, even though justifiable conduct is not contingent on justifiable resort. Half of Walzer's assertion that resort and conduct are “logically independent” (Walzer, Just and Unjust Wars, p. 21) is rejected when the St. Petersburg assumption is adopted. They remain independent in one direction: justifiable conduct is not dependent on justifiable resort. But justifiable resort becomes dependent on justifiable conduct. 26 See, e.g., Fabre, Cécile, “Guns, Food, and Liability to Attack in War,” Ethics 120, no. 1 (October 2009), pp. 36–63. 27 As indicated in the first section, no distributive criterion is usable within combat. 28 This is an almost wholly empirical judgment about human political and psychological capacities and a powerful illustration of why it is impossible to conduct practical moral philosophy purely at a conceptual level; for additional illustrations of the methodological point, see Shue, Henry, “Making Exceptions,” Journal of Applied Philosophy 26, no. 3 (2009), pp. 307–322. 29 Habermas, Jürgen, Between Facts and Norms: Contributions to a Discourse Theory (New York: Polity Press, 1996), p. 115. 30 Of course it would be better to preserve combatants' individual right to life where the latter had not been forfeited than to preserve their right to security under the law; in other words, the substantive goal of the rule of law trumps its procedural or formal benefits. However, as we have argued in the first part of this paper, if the substantive goal of legally regulating war is the avoidance of large-scale individual rights infringements, it is unachievable. So any complaint that we are prioritizing the wrong individual right is moot. 31 It would be handy if this were the case, for then one could tell whether a party was justified in pursuing its ends by observing which means it needed to employ in order to attain them. 32 By contrast, the justifiability of this party pursuing this end is not, of course, independent of the empirical judgment about which means are necessary to the successful attainment of the end. An end and the means necessary for attaining it must be assessed as a whole package. 33 We are grateful to Seth Lazar and Jeff McMahan for raising this issue. 34 For a discussion of what exactly the threat must be in order to constitute a supreme emergency on Walzer's view, see Shue, Henry, “Liberalism: The Impossibility of Justifying Weapons of Mass Destruction,” in Hashmi, Sohail H. and Lee, Steven P., eds., Ethics and Weapons of Mass Destruction (Cambridge: Cambridge University Press, 2004), pp. 139–62, at 147–54. 35 The precise interpretation of Article 51 is notoriously fraught and contested; we make no pretence of undertaking it adequately here. 36 There are indeed horrendous examples of the mutual slaughter of combatants, such as World War I. But the terrorist hypothesis is that slaughter of civilians will succeed where slaughter of combatants would fail. World War II and many failed terrorist campaigns leave this quite unclear. 37 Article XXIX, Instructions for the Government of Armies of the United States in the Field (Lieber Code), 24 April 1863. 38 For more on this see Dill, The Definition of a Legitimate Target in U.S. Air Warfare, passim. 40 McMahan, The Just Distribution of Harm, p. 353. * We are grateful to Seth Lazar and Jeff McMahan for their sharp articulations of their doubts about this project and to Cheyney Ryan for believing in it when we had our own doubts, as well as to three anonymous reviewers for this journal and the other members of the Oxford War Workshop for additional comments. Remaining errors are, of course, the fault of the other joint author.